A new Voice of the Voter poll shows that a number of people in the Rochester area have a generally negative view of their elected officials. But the people responding to the survey are more positive about officials who are closer to home. This survey by the Mason-Dixon Polling & Research firm asked a number of questions about how people in this region feel about their elected officials, as well as touching on areas that include how they feel about the direction the region, the state and the country are headed. The numbers were a little better for top local officials, but 63 percent of those surveyed still felt Rochester Mayor Lovely Warren was doing “just fair” or “poor” and 57 percent felt the same way about Monroe County Executive Maggie Brooks. Pollster Larry Harris says it’s not surprising the federal officials did worse. Local residents were generally split on whether they feel Monroe County and the City of Rochester are on the wrong track. The numbers for Monroe County were 48 percent who said it’s going in the right direction, 42 percent saying it’s on the wrong track; for Rochester, 47 percent said it’s on the wrong track and 39 percent say it’s going in the right direction. In terms of what people responding to the survey feel is the most important issue facing New York State and the Rochester area, the economy topped the list, but as far as the top issue facing the country overall, terrorism came in number one, with the economy and Ebola tied for second place. Harris says that pocketbook issues weigh heavily on the minds of many voters. --Health Care: how do area voters feel about the Affordable Care Act? 49 percent say it’s had no impact, 33 percent feels it has hurt their family. --Casinos: 52 percent of those surveyed oppose having a Native American run casino being built in Monroe County, 39 percent support the idea. --The Buffalo Bills: On the issue of whether residents support a new stadium for the team, 71 percent of the respondents oppose that idea, 24 percent support it. 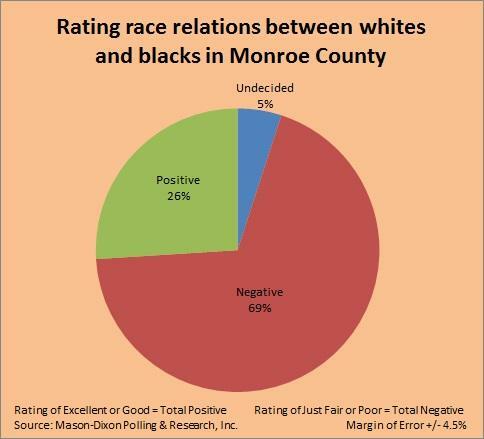 Regarding race relations between blacks and whites in Monroe County and the City of Rochester, 69 percent of those responding view those relations as being only “fair” or “poor” while only 26 percent of the people say they are “good” or “excellent”. The poll also asks if those responding living in the City of Rochester or the suburbs. 73 percent of those responding live in the suburbs and 27 percent live in the city. Pollster Larry Harris says that disparity is not unusual, because it generally reflects where the most number of registered voters live in the area that was surveyed. "If a poll is going to be conducted about the City and its Mayor, then they should poll actual City voters. If a poll is going to ask about race relations in our City, then it should be more inclusive of minority voters. This poll, as always, is not reflective of the electorate in the City of Rochester. The Voice of the Voter partners should be ashamed to release a poll with a 78 percent white and a 73 percent suburban sample size. Polls like these are flawed, and only perpetuate the feelings of disenfranchisement among City voters." 500 registered voters were interviewed by telephone for this poll, (both landline and cell phone), on October 13-16. The margin for error is plus or minus 4.5 percent. Voice of the Voter is a collaborative effort of WXXI Radio & TV, The Democrat & Chronicle, 13WHAM-TV, and WDKX 103.9. The poll was conducted by Mason-Dixon Polling & Research of Washington, D.C., for the Voice of the Voter initiative. Voice of the Voter is funded in part by a grant from the Community Foundation in Rochester.